Long Beach, Calif., Oct. 28, 2013 – The Rancho® lift kits for 2014 GMC Sierra 1500 and 2009-2013 Ford F-150 (RS6519B) trucks recently met all requirements of the U.S. Federal Motor Vehicle Safety Standard No. 126 – Electronic Stability Control Systems (FMVSS-126) test. 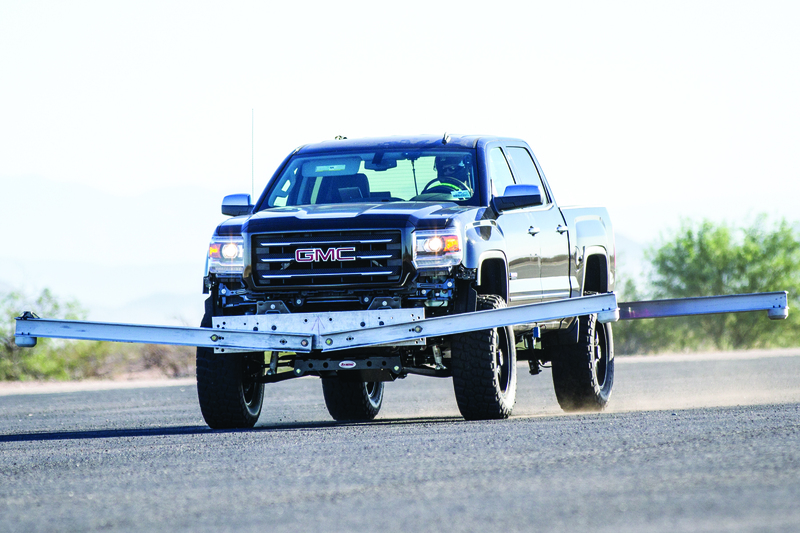 The testing was completed with a 2014 GMC Sierra 1500 that included a 6-in. Rancho suspension system, rear Rancho® RS7000MT™ shocks and front OE struts with spacers. The Sierra also was equipped with BFGoodrich® Mud-Terrain T/AKM2 325/60R20 tires and Vision Off-Road Assassin 20-in. wheels. The Rancho-equipped 2011 Ford F-150 Super Crew Limited that was tested featured a modified 6-in. Rancho lift kit and RS7000MT™ struts, in addition to BFGoodrich® Mud-Terrain T/AKM2 325/60R20 tires and OE Wheel Works 20-in. wheels. The GMC system testing took place at Arizona Proving Grounds, Wittman, Az., and the Ford system testing took place at the Ford Proving Grounds in Dearborn, Mich. Both tests were completed by Link Engineering Company of Dearborn. Gauss noted that Tenneco will continue testing aftermarket suspension systems in future product platform rollouts. The new Rancho Sierra suspension system includes the brand’s well-known, one-piece sub-frame in the new kit to help maximize performance. The Rancho sub-frame features a precision-matched fit and is constructed from ¼-in. thick steel. The Rancho Sierra system is available in two configurations to match the OE steering knuckle material, including Rancho engineered and fabricated steel knuckles or aluminum knuckles. The kit also includes a variety of components that help ensure durability and deliver trademark Rancho fit, such as high-clearance aft braces, front differential drop brackets, extended-length, DOT-certified front brake lines and more. The Rancho Ford suspension system also includes a heavy-duty, one-piece subframe constructed of high-strength low-alloy steel and CNC-machined, extended steering knuckles. Additional components also are included in the kit to deliver on- and off-road handling and performance benefits to the popular truck. Rancho RS7000MT monotube shocks and struts quickly and effectively dissipate heat to help resist overheating during extreme use. RS7000MT units provide fast, precise response in on- and off-road driving. Each monotube strut includes the spring seat. For the GMC Sierra test, the truck featured 325/60R20 BFGoodrich® Mud-Terrain T/AKM2 (34143) tires and 20-in. Vision Off-Road Assassin wheels finished in matte black. 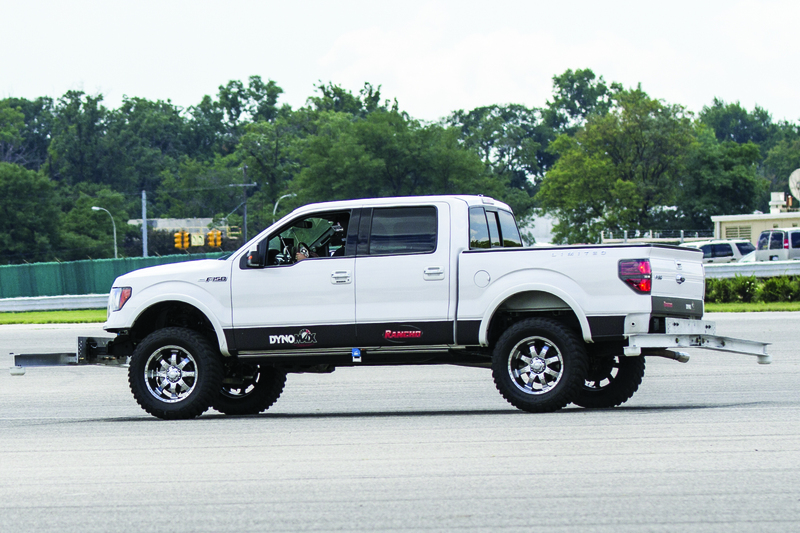 For the Ford test, the truck was outfitted with 325/60R20 BFGoodrich® Mud-Terrain T/AKM2 (34143) tires and 20-in. OE Wheel Work’s Deep Goliath Cast Aluminum wheels (222-2963V) that were finished in PVD bright chrome. To learn more about BFGoodrich tires, please visit www.BFGoodrichTires.com. For more information about Vision Wheels, please visit www.VisionWheel.com, or OE Wheel Works products, visit www.OEWheelWorks.com. Rancho suspension systems and Rancho RS7000MT series units are backed by the Rancho brand’s limited lifetime warranty, see www.GoRancho.com for more information. For additional information about Rancho products, contact your nearest Rancho dealer, call 1-734-384-7806 or visit www.GoRancho.com. To locate a Rancho authorized reseller, visit the “Where to Buy” tab on www.GoRancho.com.